SAN JOSE — The Japanese American Museum of San Jose will celebrate its 25th anniversary with a gala on Saturday, Dec. 1, at Hyatt Place San Jose/Downtown Hotel, 282 Almaden Blvd. in San Jose. Wine-tasting and no-host bar at 5 p.m. Dinner and program at 6 p.m., featuring San Jose Taiko and guest speaker Greg Kimura, president and CEO of the Japanese American National Museum in Los Angeles, with Mike Inouye of NBC Bay Area as master of ceremonies. The hotel normally charges a minimum of $10 for parking. At the registration desk, non-overnight guests may purchase a $10 parking voucher for the evening. Parking is also available at nearby parking lots. From JAMsj’s inception to today, the passionate, all-volunteer organization has always been dedicated to presenting educational and entertaining programs to the community. Established in November 1987, JAMsj grew out of a 1984-1986 research project on Japanese American farmers in Santa Clara Valley. The farming project collected family histories, historical photographs, private memoirs, and other unpublished documents. This project led to the creation of a curriculum package on Japanese American history and to the development of the award-winning book, “Japanese Legacy: Farming and Community Life in California’s Santa Clara Valley,” co-authored by Dr. Timothy J. Lukes and Dr. Gary Y. Okihiro. Okihiro, along with Ken Iwagaki, the late Eiichi Sakauye, and current JAMsj curator Jimi Yamaichi, formed the core group of visionaries who understood the importance of presenting the research, oral histories, and artifacts to the general public. In 1987, JAMsj opened its first location in an upstairs room of the historic Issei Memorial Building, formerly the Kuwabara Hospital. 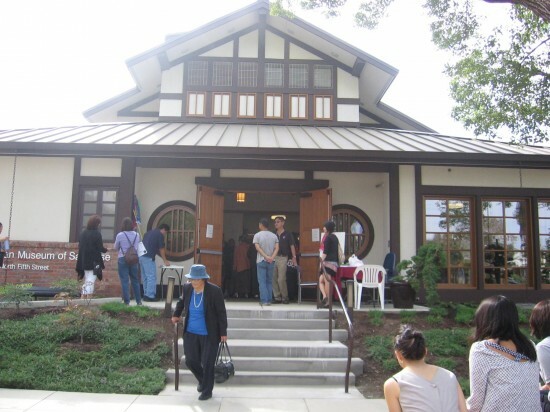 In 1999, thanks to a generous donation by Sakauye, JAMsj later moved to its present location, the former residence of Dr. Tokio Ishikawa, a prominent Japantown physician. In the fall of 2006, the museum underwent an ambitious remodeling and expansion project. In October 2010, the museum reopened after the completion of this project. The new space provides more exhibit space for JAMsj’s extensive artifact collection and a venue for community programs.